We manufacture High Performance Fiber Collimators that are designed to give highly collimated beams with high transmission and low transmitted wavefront error. Our unique multi element design ensures you get a clean Gaussian beams with no diffraction effects at any distance. Our adjustable focus collimators can replace 3 or 4 fixed wavelength collimators. You can optimize collimation to your operating wavelength and lock it down. Besides collimating the beam you can also diverge the beam for illumination or focus the beam to micron size spots at some distance. This is ideal for sensors, chemical and biological threat detection. Our choice of materals minimizes any fluorescence effects caused by other fiber collimators and minimizes some temperature effects. Having excellent optical design minimizes your laser power requirements and gives you much higher signal strength. We offer various aperture sizes from 1.6mm to 100mm to generate various beam sizes. All collimators have an FC or FC/APC receptacle as standard with SMA as an option. The smaller collimators have fine 80 pitch threads for fine focus/collimation adjustment. The larger collimators have focus adjustment with no rotation. Four wavelength regions cover the spectrum from 350nm to 2300nm. All optics have a broadband AR coating. For use in the UV, high power applications and radiation environments, see our all fused silica Fiber Collimators. See the "Related Products" section to the right for more Fiber Collimators. 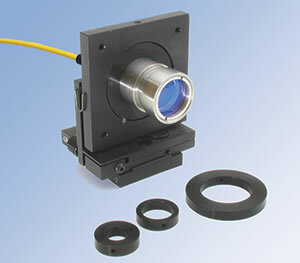 A series of adapter rings and mounts are available to mount the collimators to common optical mounts, tables or tripods. For those trying to capture light, we also have a Fiber Receiver/Collector. 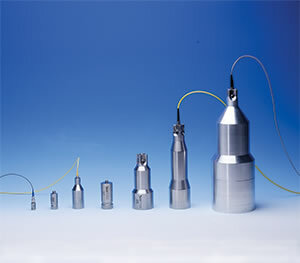 For OEM users we have pigtailed collimators for a specific wavelength. We can customize for wavelength regions, beam sizes, housing requirements or environmental conditions such as space, vacuum, radiation or magnetic. We design and manufacture our own optics, fibers assemblies and housing giving us full control of the manufacturing process. * Beam size is measured at 1/e^2 points at 635nm using fiber with NA=0.13. ** Options for SMA receptable or pigtailed version. For Larger Fiber Collimators go to "Large Fiber Collimators" to see FC40, FC45 and FC100. Accessories include Mounting Adaptors and various Optical Fibers.